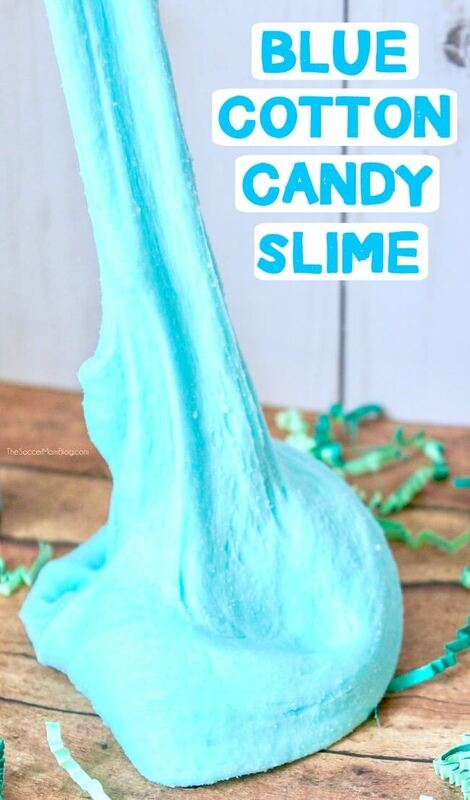 Your kids will go wild over this fluffy slime inspired by the classic Nickelodeon Gak! It squishes, pops, and makes all sorts of funny noises! Note: We’ve included ad links to products we love and use; disclosure policy here. 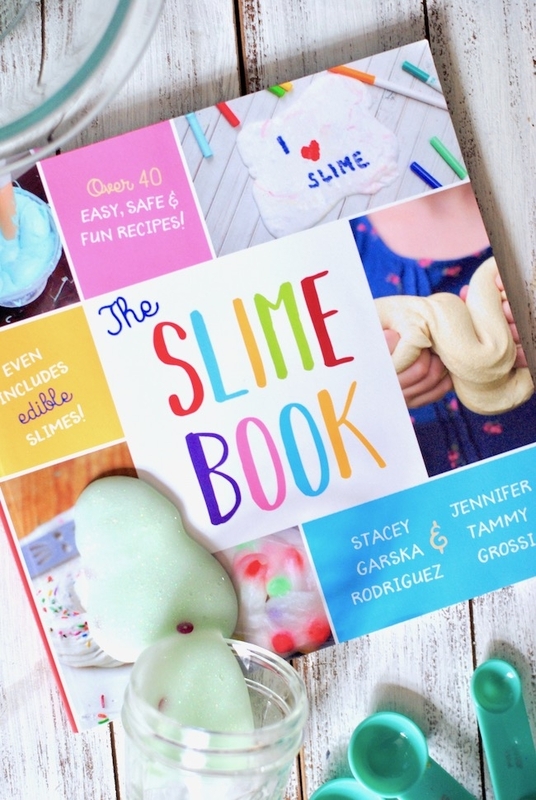 After seeing our new 3-ingredient fluffy slime recipe, Stacey sent me a message asking if I could create a fun slime recipe to share with her readers inspired by Nickelodeon Gak. 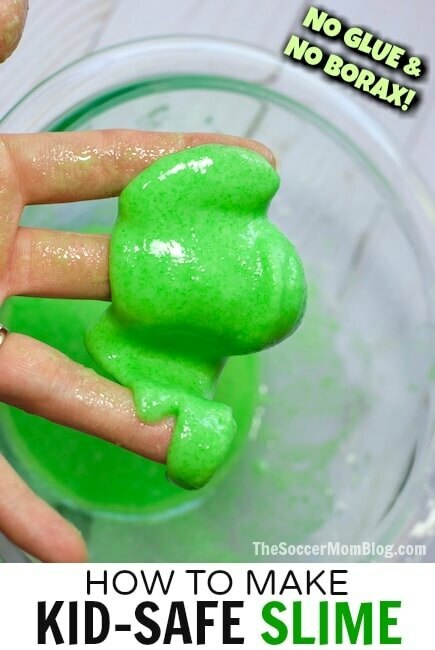 This “popping” Gak recipe makes fun noises and is super squishy to play with, without sticking to you or your kids’ hands. Plus, it’s easy! We have been playing with slime for years — it’s one of our favorite sensory play materials and it never gets old. Sometimes we change up our recipe (like with our bubble slime), but for the most part just changing the color or adding some scent or glitter is enough to make it super exciting again. 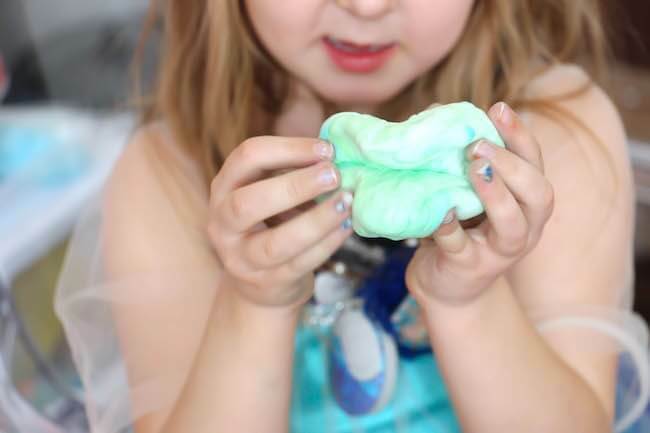 This “popping” Gak fluffy slime recipe uses my new favorite ingredient for creating super fluffy slime — SHAVING CREAM! 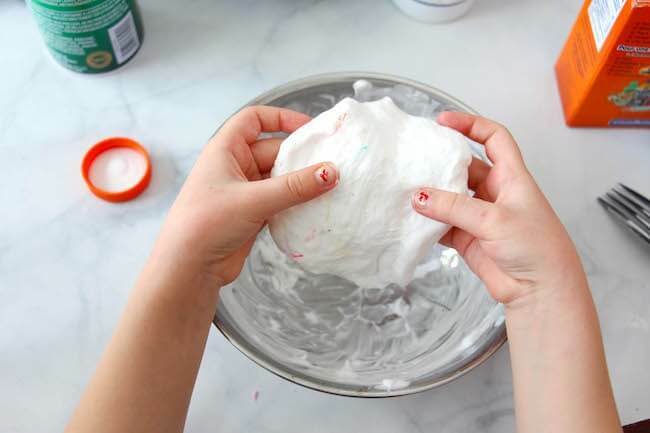 Important – Be sure to buy a good quality shaving cream if you or your kids have sensitive skin — if you wouldn’t normally use it on your face, don’t use it in your slime. Now on to the fun part!! Note: As with many slime recipes, this involves a chemical reaction. Some ingredients may cause irritation to sensitive skin. Only allow children to play with slime under adult supervision. Click here for more tips on how to make slime safely. To make your borax solution, mix 1/2 cup hot water with 1/2 Tablespoon borax and stir to dissolve. Set aside to let cool before you add it to the slime mixture. 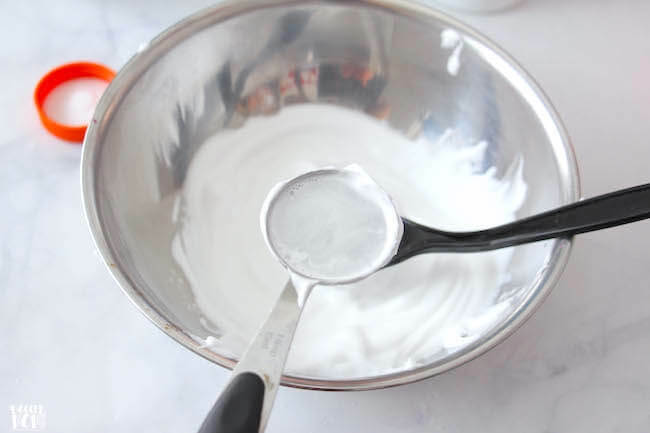 In a separate mixing bowl, combine the glue, water and shaving cream. Fold together with a large spoon until completely incorporated. Add any food coloring if using, and mix well before adding in the contact solution. Add the borax solution 1 Tablespoon at a time – do not add more than 4 Tablespoons total. Stir each Tablespoon in well and watch how the slime reacts before adding more. When the slime starts to form a cohesive ball and pulls away cleanly from the bowl, you may begin kneading the slime with your hands. Knead it for at least 2 minutes – if it’s still sticky, add a bit more of the borax solution. 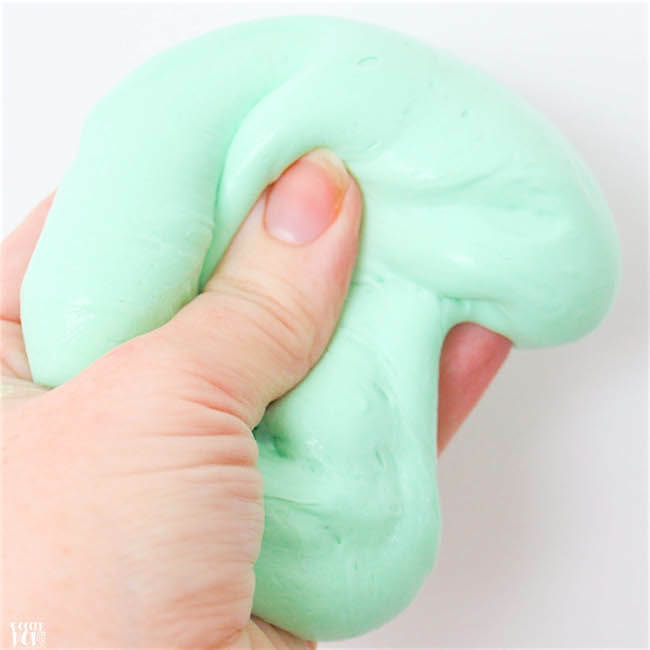 Your slime should be stretchy, squishy and fluffy – and make lively popping noises when it’s squeezed, slapped or ripped it half. So much fun!! 2- Slime can stick to fabric, so keep a bit of vinegar on hand to easily remove any wayward slime out of clothes… hair… carpet. OK, so maybe your kids will be less messy than mine, but I think it’s always a good idea to prepare yourself for the mess and if it doesn’t happen – great! 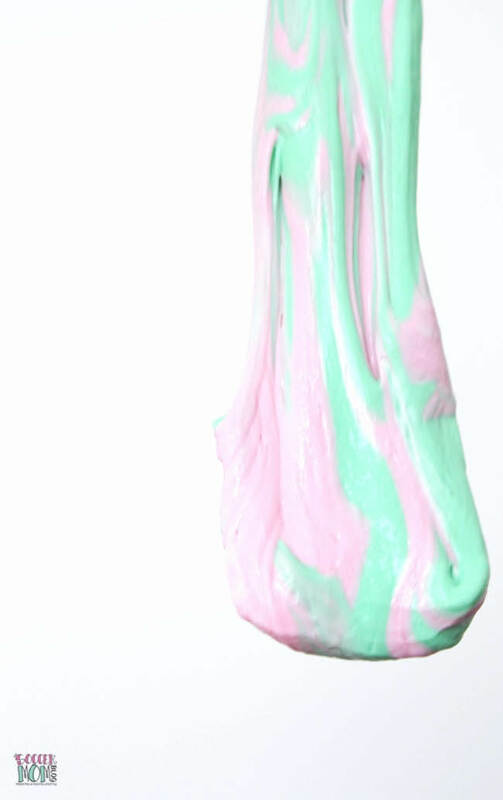 There are three starter slime recipes that form the base for hundreds of awesome slime variations, like this Gal Slime. Once you master these basic recipes, you can make almost anything! Be sure to check out our fluffy Blue Cotton Candy Slime too! 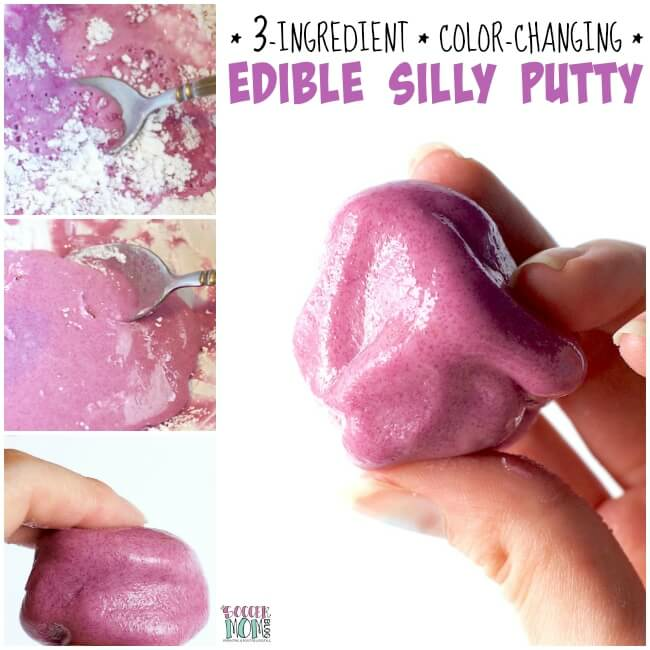 We also love glue-free edible slimes!